Heroes and monsters clash with government forces in an apocalyptic London. Two years after London is struck by a devastating terrorist attack, it is cut off from the world, protected by a large force of soldiers (known as Choppers), while those in the rest of Britain believe that their ex-capital is now a toxic, uninhabited wasteland. Jack and his friends know that the truth is very different. The handful of survivors in London are developing strange, fantastic powers. Evolving. Meanwhile, the Choppers treat the ruined city as their own experimental playground. 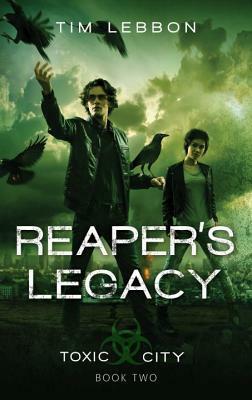 Jack's own developing powers are startling and frightening, though he is determined to save his father, the brutal man with a horrific power who calls himself Reaper. Jack must also find their friend Lucy-Anne, who went north to find her brother. What Lucy-Anne discovers is terrifying--people evolving into monstrous things and the knowledge that a nuclear bomb has been set to destroy what's left of London. And the clock is ticking. Tim Lebbon is a "New York Times"-bestselling writer from South Wales. He has had over twenty novels, dozens of novellas, and hundreds of short stories published to date. Recent books include "London Eye" (Toxic City Book One), and "The Map of Moments" (coauthored with Christopher Golden). He has won four British Fantasy Awards, a Bram Stoker Award, and a Scribe Award, and has been a finalist for International Horror Guild, Shirley Jackson, and World Fantasy Awards. Fox 2000 recently acquired film rights to his book series The Secret Journeys of Jack London, and Tim and Christopher Golden have delivered the screenplay. Visit Tim online at www.timlebbon.net and on Twitter @timlebbon.